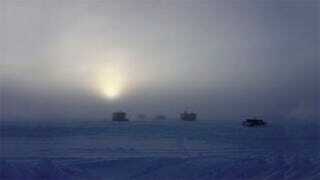 You're looking at Valkyrie Dome aka Dome Fuji, on the East Antarctic Plateau. Near these dark structures there is a ridge with hollows that can get down to minus 133.6 degrees Fahrenheit—minus 92 degrees Celsius. A team of NASA and US Geological Survey scientists have now officially declared this ridge The Coldest Place On Earth. The discovery comes after analyzing data gathered by the new Landsat 8 satellite along with 32 years of information accumulated by other spacecraft's weather instruments. According to NASA, "the new record of minus 136 F (minus 93.2 C) was set Aug. 10, 2010," which "is several degrees colder than the previous low of minus 128.6 F (minus 89.2 C), set in 1983 at the Russian Vostok Research Station in East Antarctica."